Three months is all the time we had to enjoy the idea of our new house. Nestled in the suburbs outside Colorado Springs, I just knew this house was the forever home where our two boys, Eddie and Jeffrey, would finish school and maybe – one day in the future – bring home a grandkid or two. That was our dream until I received a phone call that would change our lives forever. The call was to tell me that my husband, Roger, the bravest person I know, was in critical condition. That bravery is what had led him to dedicate 18 years of his life serving our country in the Army. As a military brat myself, I was used to the frequent moves, new schools and time away from my Dad. But, I always took comfort in knowing that my Dad was making a difference. Roger was doing just that in the spring of 2011 when an explosion overturned his vehicle. In that moment, Afghanistan didn’t just feel a continent away, it felt worlds away. Thankfully Roger survived. Others in his unit did not make it home. Because of the attack, Roger sustained a traumatic brain injury and other injuries. Those first few weeks after his injury are still mostly a blur, made up of countless hospital visits, talking with specialists and finding what services he would need to recover. One of the first things I learned was that a high altitude can be dangerous for patients like Roger. Our plans to stay in our Colorado Springs home would need to change. Shortly after Roger was released from military duty, we moved to a small community 45 minutes north of Phoenix, Arizona. In our new town, we would be close to two VA centers where Roger was receiving outpatient care. Leaving my teaching job in Colorado behind, I became Roger’s full time caregiver. We enrolled our boys in the local public school. The school worked well for Eddie, but Jeffrey, who has ADHD, needed a different environment. I had considered homeschooling, but didn’t know how I could care for Roger and give Jeffrey the support he needed to grow academically. That’s when a friend told me about Arizona’s Education Scholarship (ESA) program. The program empowers parents of students with disabilities and military families to direct funding reserved for their child’s education. Through the program, I was able to completely customize Jeffrey’s education by using ESA funds to cover tuition, tutoring and therapies. We enrolled Jeffrey in North Valley Christian Academy, which specializes in helping students with unique abilities reach their fullest potential. When I sat down with school staff, they created an individualized service plan for him that included social and emotional goals, along with academic ones. I had a say in everything included in the plan and through the school’s B.E.S.T. program, Jeffery was able to meet the high expectations set for him. I’ve been involved with the school for the past three years, first as a parent and now as a part-time teacher as Roger is making tremendous progress in his recovery. In my job, I get to help students reach higher and farther than they have ever dreamed possible. For many students in the program, advanced courses and even college are on the horizon. That’s a big deal for parents who have worried their children would be written off all because of a disability. Roger’s progress is a constant reminder to me that every person is deserving of the services they need to thrive – whether a child in a classroom or an 18-year Army veteran. Participating in Arizona’s ESA program has strengthened my belief that all families should have a greater say in their child’s education, especially military families. Moving schools every few years is already hard enough, without having to worry that your children are not getting the education they need to be successful. Thankfully, because Roger and I can choose the school that works best for our boys I know they are on the path to success. For me, I am happy to be back in the classroom working with students again. It gives me a sense of normalcy among so many changes. Our story reminds me that life’s greatest challenges also bring about some of life’s most cherished blessings. Donna Lynn Pellegrini-Lange and her husband Roger recently celebrated their 19th wedding anniversary. 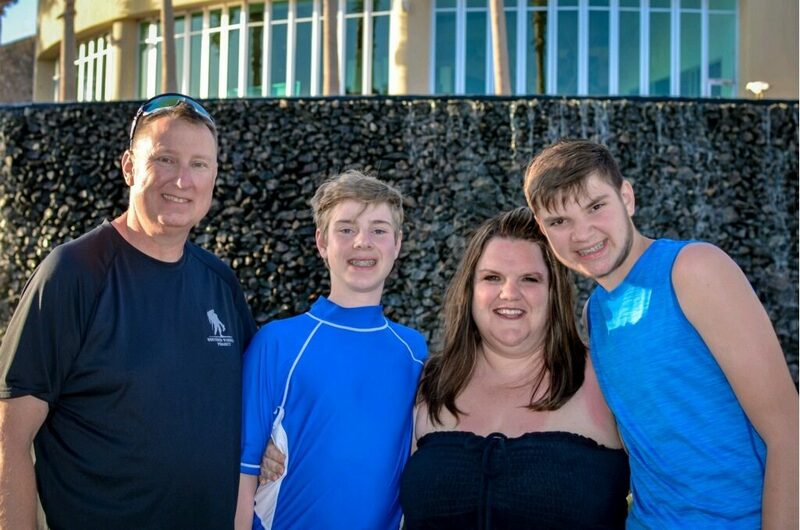 In addition to teaching part time at North Valley Christian Academy, Donna Lynn is also a caregiver to Roger and their two sons – Eddie and Jeffrey. You can follow Donna Lynn’s parenting adventures on Instagram at @PellegriniBoys.